This article will help you understand anchor text so you can make it easier for your site visitors to understand your content and make it easier for them to find and get to the things that interest them. Properly using anchor text can also improve your SEO. 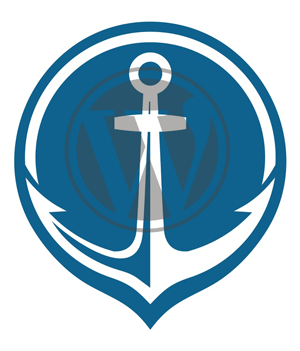 Below you will discover what anchor text is, why you need it, and how to easily use anchor text when creating WordPress links including how to create a jump-to link. The anchor text, link label, link text, or link title is the visible, clickable text in a hyperlink. The words contained in the anchor text can determine the ranking that the page will receive by search engines. So, in short, “anchor text” is just the word or words you see when you see a link. For example, the anchor text of the link in the Wikipedia definition above is the word “hyperlink” whereas the anchor text of the link I used in the above introductory paragraph is “create a jump-to link”. Now that you know what anchor text is you may be wondering why it matters; that is, how do you benefit by properly using anchor text in specific ways. Over the years, blogs posts have been getting longer with more in-depth content. There are some good reason for that, but one potential negative is that it can be harder for your readers to find what they want. Anchor text can help you organize your content better and allow your readers to find and go directly to those sections that are of particular interest to them. Since your readers can get to what they want more easily that means they will become more engaged with your website and are more likely to stay on your site longer. A blog post that is packed full of information yet lacks organization makes it hard for visitors to get to that information. It can potentially drive your readers away in frustration. A well-planned link strategy is essential to a logically organized website that produces a positive user experience, and anchor text is an important part of that strategy. In fact, an effective link strategy will guide visitors to other interesting content within your website or to other websites. Just remember that if you do link to another website, make sure to open that site in a new tab or window. Otherwise, you’ve lost your visitor. Keeping visitors on your site longer as they explore the additional content will also cause your bounce rate to decrease. Google rewards websites that have lower bounce rates with better search engine rankings so it helps with your search engine optimization (SEO). An additional SEO benefit of longer, more organized content is that Google views it as better quality and more authoritative. Plus, more authoritative articles easily pick up backlinks, which are also very important for ranking well in the search engines. Those articles also tend to enjoy more social shares, which is yet another SEO benefit. Anchor text is an important part of SEO because search engines determine what’s called link relevancy from your anchor text, and that is one of the key things they use to rank web pages. So be sure you choose relevant keywords you want to rank for and use them when you create anchor text. There are different types of anchor text, so become acquainted with them and learn which ones are recommended for backlinking and SEO. For example, the phrase “Click Here” is frequently used as anchor text, but it should be used sparingly. This is because relevant keywords are more powerful as anchor text. But using only keywords, particularly the same keywords over and over, signals to the search engines that you are trying to trick them. So use “Click Here” and other non-keyword related anchor text for a certain percentage of your anchor text. Just make sure it feels natural. 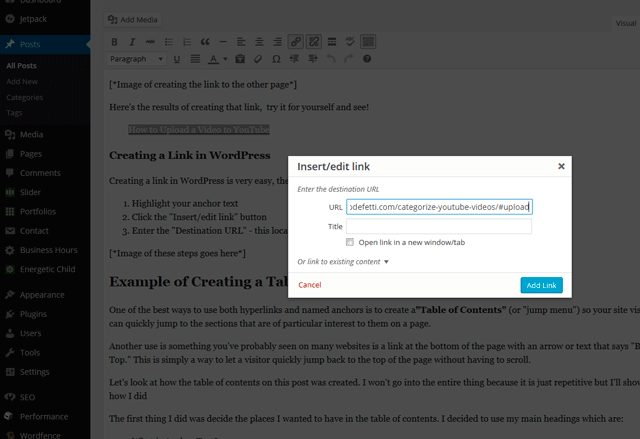 WordPress makes it relatively easy to create links with your desired anchor text so you can use the power and convenience that they provide to you and your readers. Before getting into that, let me briefly give you a quick look at the techie side of things. If you have no interest then skip past these next two sections. You’re probably familiar with what a hyperlink is. but let’s dissect the parts of a hyperlink and look at the HTML tags and attributes used. You see in the above example how the anchor text creates a keyword-relevant link. A hyperlink constructed in this way creates a link to a website page. However, there may be times when you want to link within a page so let’s take a quick look at doing that. The difference between a normal hyperlink and a “Jump-To” link is there is one additional thing you need to do. You need to create what’s called a “named anchor,” which is a fancy way of saying we need to tell the web browsers where, inside the content of a page, to jump to when the link is clicked. Notice how the heading 2 tag (the <h2>) has an attribute named “id” and it has any value you set it to. Not only can you jump to a section on the same page you can also jump to a section on another web page. For example, let’s say I wanted to create a link that would send a visitor to the section of my YouTube post that explains how to upload a video to YouTube. First, I would need to set up the named anchor in the YouTube post at the location where I want the link to jump to. Here’s the results of creating that link, try it for yourself and see! One of the best ways to use both hyperlinks and named anchors is to create a“Table of Contents” (or “jump menu”) so your site visitors can quickly jump to the sections that is of particular interest to them on a page. Another use is something you’ve probably seen on many websites. It’s a link at the bottom of the page with an arrow or text that says “Back to Top.” This is simply a way to let a visitor quickly jump back to the top of the page without having to scroll. Let’s look at how the table of contents on this post was created. Then I went to each of the 5 sections and added a named anchor, and, finally, I went to the top of the post and added the table of contents. In this article we saw that anchor text is the words you see when you see a link. We then looked at some of the benefits of properly defined anchor text including helping you organize your content, making it easier for people to find and get to your content so your site visitors stay on your site longer, and how anchor text can improve your search engine rankings. We saw how to create both hyperlinks and named anchors so you can let people jump to specific sections of your site. 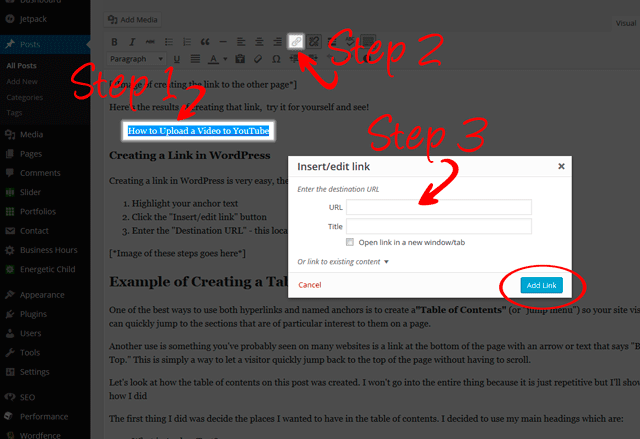 Finally, we saw how to create a table of contents for your posts and pages. Leave me a comment letting me know what you think or if you have any questions. I’m happy to help! Excellent information and tutorial, Michelle, on creating anchor text right as it relates to SEO and for a great user experience. Love the video, too! Thanks so much for your comment, Robin. Anchor text can be really helpful in so many ways, and I’m glad you found value in the post and tutorial! Appreciate you taking time to let me know! Outstanding information, Michelle. Your examples clearly show how to create the different anchors and the benefits of using them. Definitely a resource I will bookmark and refer to in the future. I really appreciate your comment, Nancy! Anchor text is definitely an important concept to understand especially as it relates to SEO. Thanks for taking time to leave your feedback!